People can disagree about whether corporations pay too little or too much tax, but first we have to know what they pay. Unfortunately, in a report released today the Congressional Budget Office (CBO) has vastly understated a measure of the effective tax rate paid by corporations. The main issue is that there are two types of corporations: C corporations that pay the corporate tax and S corporations, which are pass-through entities that pay the individual income tax and are not subject to the corporate tax. The C corporations are what we generally think of as "corporations" in most discussions, but the CBO has mixed and matched the two in an inconsistent way, counting C corporation taxes but C plus S corporation profits. 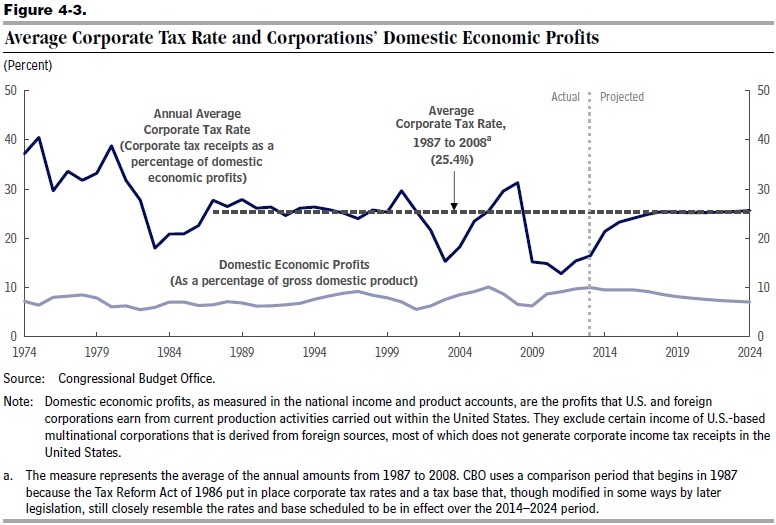 Figure 4-3 (shown below) from the CBO report depicts the "average corporate tax rate" from 1974 to today and projected out to 2024, indicating the average corporate tax rate was 16.47 percent last year, 12.83 percent in 2011, and otherwise around 15 percent since 2009. However, according to the latest IRS data the average corporate tax rate is about 50 percent higher in those years, when the data is restricted to just C corporations. The second chart below shows the average corporate tax rate based on IRS data, calculated as C corporation taxes paid divided by C corporation taxable income. The average corporate tax rate was 22.3 percent in 2009 and 21.0 percent in 2010. The main difference between the CBO and IRS numbers is that the CBO has included the pass-through businesses in their measure of profits, even though those businesses are not subject to corporate taxes but rather pay under the individual tax code. Particularly, the CBO is using as their corporate tax base measure domestic economic profits from the BEA, which includes both C and S corporations, even though S corporations are pass-through entities not subject to the corporate tax. This matters more and more, as S corporations have been growing relative to C corporations for over 20 years. It is now the case that about 30 percent of the profits measure used by CBO and BEA is due to S corporations. Hence, any calculation of the average corporate tax rate based on these numbers will be about one-third too low.